Join Millette Núñez and John Karvelis, with an amazing assisting team, for 4 full days of Acrobatic Solar training, connection & playful transitions. We are not just about achieving tricks (although we will most certainly do just that) but we are also very keen on creating a container for everyone to feel empowered, embodied and fully supported. 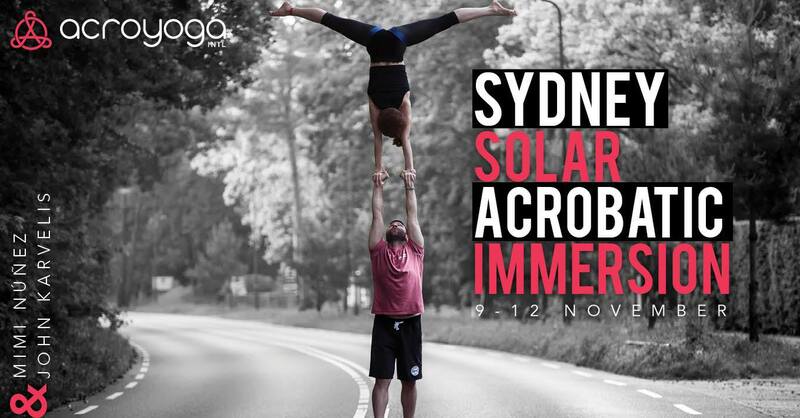 This is the second ever solar immersion in Sydney! To secure your spot, you send either the full amount or a non refundable deposit payment of $180 AUD to the account below, with “your name + SYDNEY SOLAR” as reference, and pay the balance upon arrival to the immersion. After payment of full amount, cancellations before 29 Sept = full refund, minus $70 AUD processing fee. Cancellations between 29 Sept – 1 Nov = 50% refund. After 1 Nov or during the event, no refund and no exceptions. Mimi has been traveling and sharing her love for acro worldwide since 2012. A seasoned teacher, she understands the importance of setting high standards while simultaneously building people’s beliefs in their own capacities. She creates an environment in which students are challenged, feel safe to take risks and are supported to learn. Known for her positive demeanor, high energy and encouraging style of communication, Mimi loves to have fun and remind others how awesome they are. She is a teacher trainer and immersion/intensives teacher for both AcroYoga and PartnerAcrobatics.com. She loves Hello Kitty and good coffee.